If you could change one part of the criminal law, what would it be? The editors put this question to nine leading academics and practitioners. 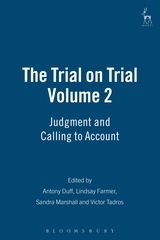 The first nine chapters of the collection present their responses in the form of legal reform proposals, with topics ranging across criminal law, criminal justice and evidence – including confiscation, control orders, criminal attempts, homicide, assisted dying, the special status of children, time restrictions on prosecution, the right to silence, and special measures in court. Each chapter is followed by a comment from a different author, providing an additional expert view on each reform proposal. 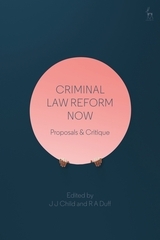 Finally, the last two chapters broaden the debate to discuss criminal law reform in general, examining various reform bodies and mechanisms across England, Wales and Scotland. Criminal Law Reform Now highlights and explores the current reform debates that matter most to legal experts, with each chapter making a case for positive change. 1. Reflections on Proceeds of Crime: A New Code for Confiscation? 6. How Should the Criminal Law Respond to the 'Special Status' of Children? 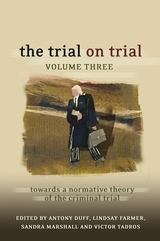 J J Child is a Senior Lecturer in Law at the University of Birmingham; and Co-founding Director of the Criminal Law Reform Now Network. 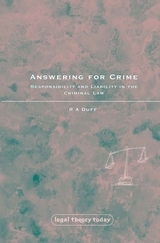 R A Duff is a Professor Emeritus in Philosophy at the University of Stirling.